Teixobactin, a newly discovered antibiotic, has not only proven to be an effective bacteria killer, but promises to put an end to the growing threat of antibacterial resistant diseases. When antibiotics first began to be widely used during the 1940s, they were seen as a miracle drug that cured a number of prevalent bacterial diseases. However, with the growth of bacteria-resistant infections stemming from continuous and improper use of antibiotics, the UK’s chief medical officer Sally Davies in a World Health Organization report last year warned that the world was entering a “post-antibiotic era,” according to The Guardian. Indeed, today, antibiotic resistance disease kills about 23,000 people in the US annually. Scientists estimate that if nothing is done, by 2050, that number could be up to 10 million, according to Medical Daily. “Approximately 99 percent of all species in external environments are uncultured (do not grow under laboratory conditions),”said Kim Lewis, director of the Antimicrobial Discovery Center at Northwestern University and leading researcher on the study of teixobactin. In other words, only about 1 percent of possible antibacterial sources can be reliably re-created in a lab; Lewis explained that this is the biggest problem with finding new and promising sources of antibiotics. However, Lewis and his team effectively solved this problem by extracting live bacteria from dirt using a device known as the iChip, which mimics the soil conditions found in nature. “Essentially, we’re tricking the bacteria,” Lewis explained. With the help of the iChip, Lewis and his team were able to screen thousands of bacterial strains and found the most promising antibacterial candidate in teixobactin. In test tubes, teixobactin killed strep and staph bacterial strains, as well as anthrax and tuberculosis. When tested in mice, it again proved effective in killing strep and staph, including a strain that was formerly drug resistant. What makes teixobactin unique among antibiotics is that it is especially difficult to build resistance against. In addition to simply killing bacteria at an incredibly fast rate, teixobactin attacks bacteria by blocking fatty acid molecules needed to build cell walls, unlike other antibiotics which only target bacterial proteins, according to The Guardian. Others, however, remain skeptical. Dr. David A. Relman, a medicine professor at Stanford, while agreeing with the potential of teixobactin, warned against “unsuspected mechanisms of resistance,” which may develop as the drug is used more. 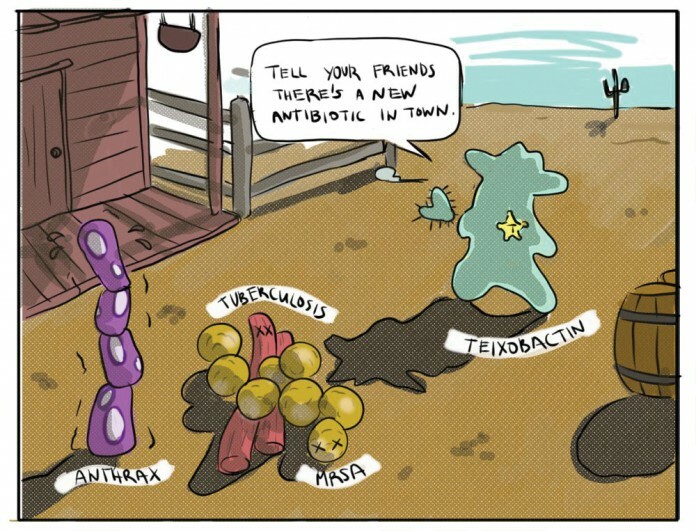 The one definitive drawback of teixobactin is that at the moment, it is only effective against gram-positive bacteria, which have thick cell walls and lack an outer membrane, and not gram-negative bacteria, which are further protected by an outer membrane, and which include some of the most antibiotic resistant diseases, like pneumonia and gonorrhea, according to Science 2.0. Lewis, however, explained that researchers are currently working to modify the antibiotic to be effective against gram-negative bacteria. While teixobactin has proven effective in mice, it may be several years before a form of it appears on the market. Testing on humans, a process that itself will take several years to complete, will not begin for about two years, provided that the drug passes all of the required tests. In addition, teixobactin itself may have to be modified so as to work on humans. In all, Lewis predicts that it won’t be available for at least another five or six years, and possibly up to 10, according to the New York Times. Perhaps what is just as important as the discovery of teixobactin, though, is the method used to find it. Growing bacteria from soil in a laboratory can now give researchers access to thousands of new strains which could be used to treat infections and even cancer. With these new developments, modern medicine is poised to make an incredible breakthrough.